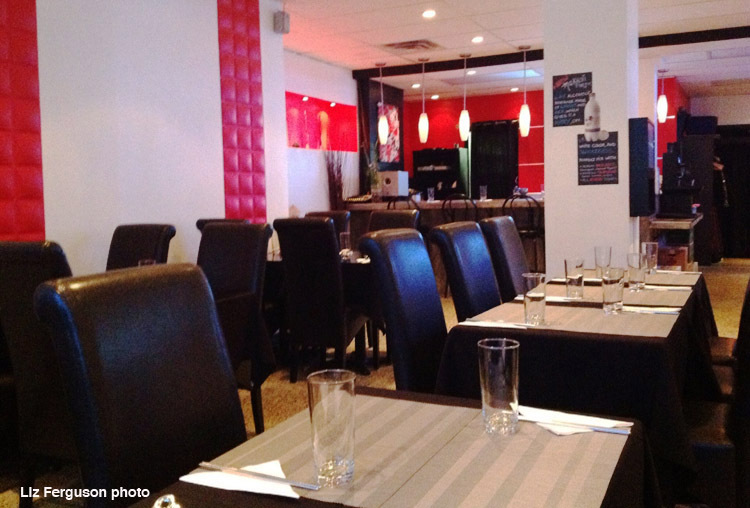 I go there because the location is convenient for me and for the friend who introduced me to the place the people working there are friendly and welcoming, and the food is tasty and reasonably priced (though prices have gone up a bit recently). I went there again last week. While waiting for my friend, I had a bit of a chat with server Justine. When I asked her if she spoke Korean, she said that she knew some expressions and the names of the dishes on the menu (of course) but she didn’t really know the language. She wants to learn Korean, though. So I told her about the classes I take at the Ganada Language School and wrote down the details. She was really happy to learn about the place, and I was really happy to tell her about it. What did we eat? My friend ordered, and really enjoyed, a stir-fried squid dish (ojingeo bokkeum), while I asked for one of my favourite dishes, the dolsot bibimbap. I usually go for that or bulgogi. (Creature of habit!) 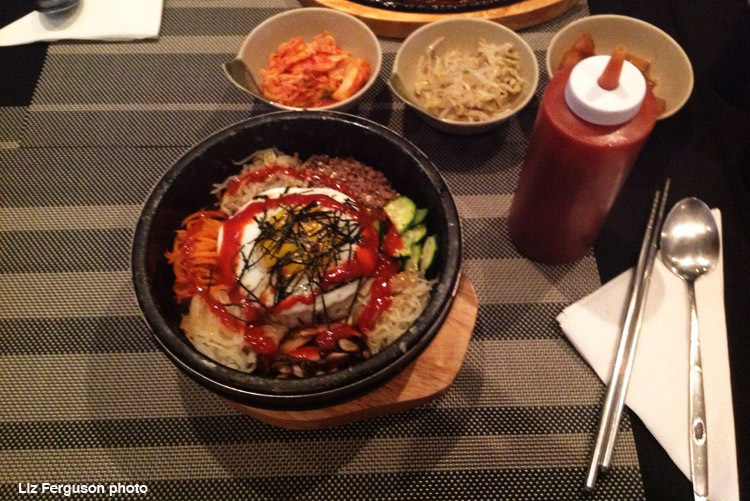 Bibimbap is a dish that features vegetables, an egg, and beef or tofu on top of a generous portion of rice. So, there’s quite a bit of variety there and I never eat enough vegetables at home, either. If you order bibimbap in a dolsot – a hot stone bowl – your food will stay hot for a very long time, and there will be some much-prized crunchy bits of rice when you get to the bottom of the bowl. That bowl will be sizzling hot (you will hear it!) when it arrives at your table, so be careful not to touch it! Add some pepper paste to the bibimbap if you like, and then stir everything together. Yum! I first had bibimbap many years ago in New York, when I went down there for a salsa show. I didn’t know about the stirring part; luckily the waitress stirred it for me. I felt like a kid again (in a good way) with my mother or grandmother looking after me very kindly. 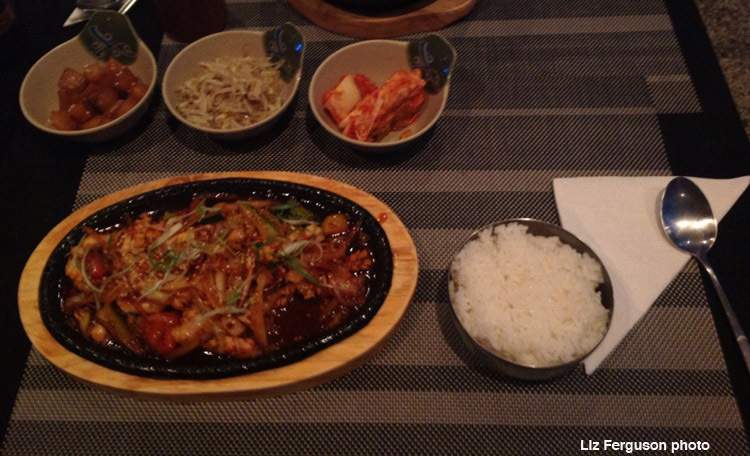 Note the little dishes at the top of the photo; those are the banchan. From the left, cubed potatoes (one of my favourites) bean sprouts, and cabbage kimchi. If you eat it all and you’d like some more, just ask, no problem! There’s no extra charge. Later, some young women seated nearby heard us talking about the language classes and asked us about them. Their meals looked really good, so I asked about them, too. “Delicious,” they both said. I had already overheard them talking about K-dramas, so I asked them how long they had been watching them and which ones they liked best. One woman had been watching them for years, while the other one had just had her first taste of K-drama that very day! Oh, my. From what I’ve heard, they can become VERY addictive. (I could assume that most people who find themselves on the Korea Canada blog know what K-drama is, but I might be quite wrong in doing so! So: K-dramas are South Korean TV shows that air in prime time. They usually have a fixed running time, sometimes as short as 12- 24 episodes. Even really popular K-dramas would not go on for years and years. Some shows are set in the present, but there are lots of historical dramas, too, with beautiful costumes, court intrigues, etc. Scripts are not worked out very far in advance, so if a particular character becomes very popular, he or she might be given a bigger part in the drama. Also, despite the name “K-drama” some shows are actually romantic comedies. Singing stars are sometimes given roles in K-dramas. OK, where were we? The K-drama veteran usually waits until a series is over before she starts watching. That way, if she really likes it, she can binge watch, and not face the awful frustration of WAITING for the next episode. I asked her about her faves, but foolishly I did not write them down right away. (I was in casual mode, as opposed to journalist mode.) I remember My Lovely Sam Soon, though, because I had been reading about it just the other day. I’m sorry now that I didn’t ask these K-drama fans if I could take their picture for this blog post. I’m kind of shy about having my own photo taken, but sometimes I forget that other people might not be. Anyway, the precise subjects of our conversations last night are not that important. The thing is, by sharing our enthusiasm for Korean food, Korean entertainment, and Korean culture in general, it felt like an instant bond was created between us, which was really nice! And that’s quite appropriate, too, since Chingu, the name of the restaurant, does mean “friend.” Check out the Facebook page for Chingu. 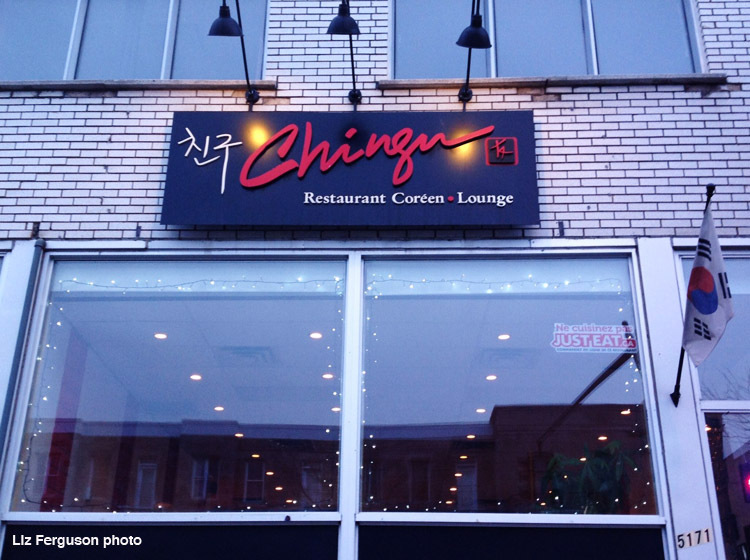 Chingu’s address is 5171 Park Ave., near the corner of Fairmount. Friend is also the name of a Korean film, from 2001. Maybe I’ll share my own review of it one day. Meanwhile, check out what imdb.com says about Friend. Kimchi, cheddar cheese sandwich? I’ll try that! omg! the squid dish looks so great !! and My Lovely Sam Soon is my best k-drama. Thanks Liz for this great story! Thank YOU Jessica. Glad you liked it! Some day I will be lucky enough to go to a big city and eat at a Korean restaurant. You are so lucky! Sounds like everyone had a great day. You’re right, K-drama veterans really just wait for the series to be over. That way, one can just watch until the wee hours in the morning, no longer having to wait impatiently on what’s going to happen on the next scene. Your day of sharing Korean Food, Korean Drama, and Korean Language is really awesome. Bet you guys learned a lot of Korean terms and had fun dissecting the every facet of Korean culture. Thanks for sharing your great day! Appreciation to mmy father who shared with me regarding this webpage, this blog is actually remarkable.